What car comes to your mind when you think about the combination of efficiency, power, design, and technology? What’s fast, fun to drive, efficient, and can turn quite a few heads when you’re in it? The answer what comes to our minds, undoubtedly, is Mustang. Not only it is one of the most exciting and iconic cars of our time which also has a reputation so impressive that it could not be maintained by many current automakers. All recent Mustang models were highly anticipated all around the world; for example, when the 2015 version was unveiled several years ago, the response was huge. The manufacturer had beautifully met the expectations of the audience by delivering a wide range of enhancements, including interior, exterior, engine, and rear suspension. 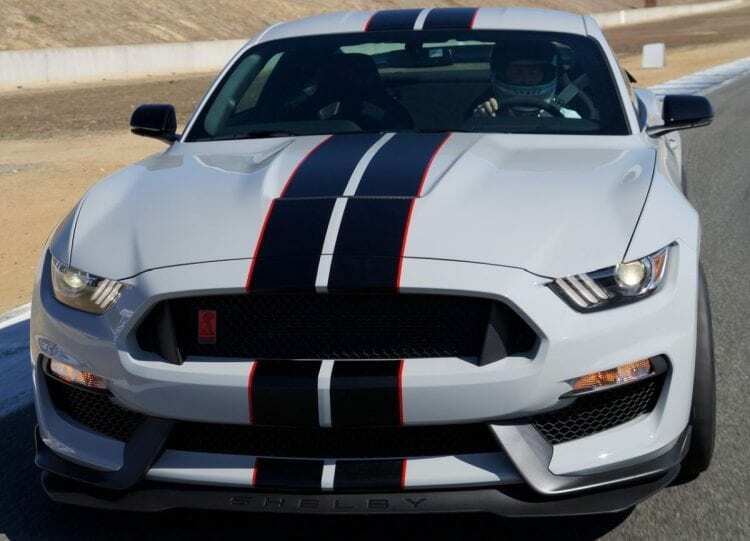 Shortly after the 2015 model introduction, the company announced the release of the new version of the Shelby model, called GT350. It was a beautiful vehicle that once again impressed the world with its capabilities and design. For example, it could reach 60 miles per hour in just 3.5 seconds and topped at 186 mph; moreover, it was called the angriest looking Mustang ever built, very aerodynamic and legitimately racing features. 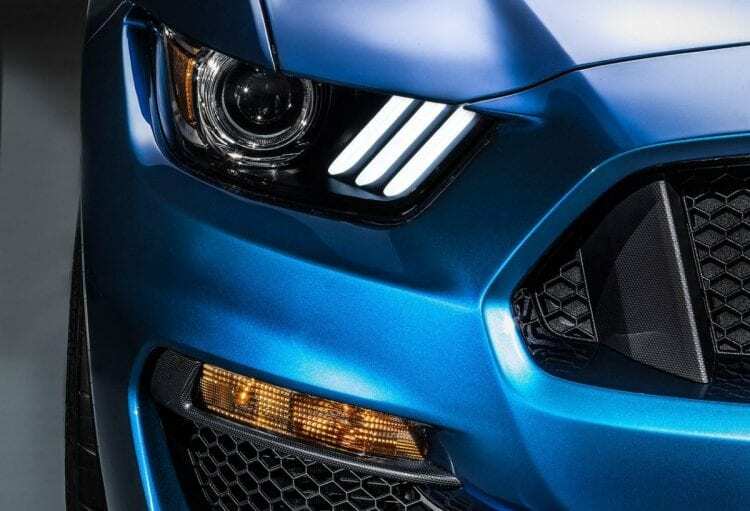 This year, the American automaker delivers yet another update of a Shelby-badged model called GT350R, and the R at the end means that this one will be the most impressive in the latest company’s line-up. Read below to know how Ford answers Camaro and what Mustang has to impress us with this time. The latest Shelby-badged Mustang model inherits most of the exterior design from the GT350. Just one look at the body of this Mustang reveals that it is the most aggressive and meanest looking model ever created. This impressive appearance is delivered by the significantly shrunken nose and stretched front end; these parts were redesigned to reduce the aerodynamic drag, improve performances and fuel efficiency. The changes continue with the new rear diffuser, vented wheel wells, and belly panels added to provide more down force-creating abilities. 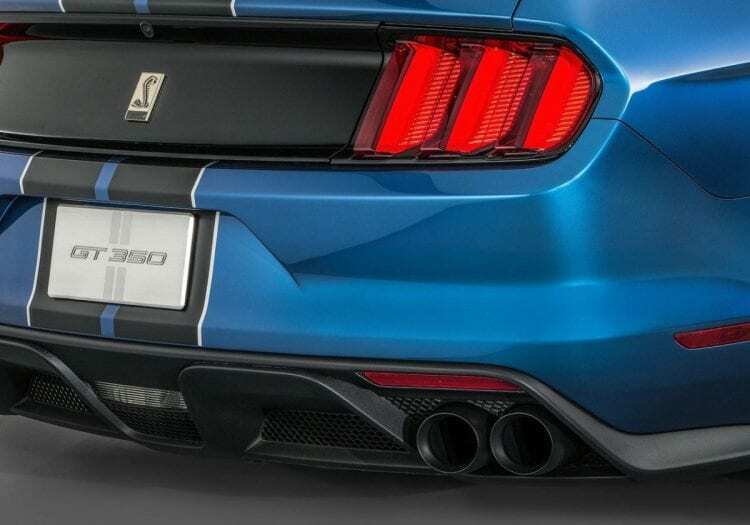 Clearly, the automaker had racing as a priority when designing GT350R because it equipped the model with a rear wing, which apparently serves for this purpose rather than cosmetics. As the result, this element moves the center of pressure rearward and improves lift balance and downforce, thus supporting the racing idea. 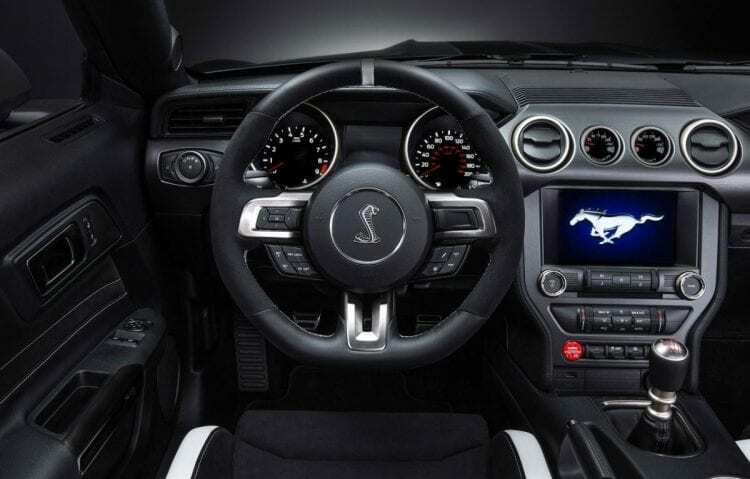 The cabin design can be quickly recognized by Mustang fans because it was made with lots of elements from the GT350. One of the most iconic bits and pieces that were carried from the previous model is the flat-bottom steering wheel with a red center mark at the top. 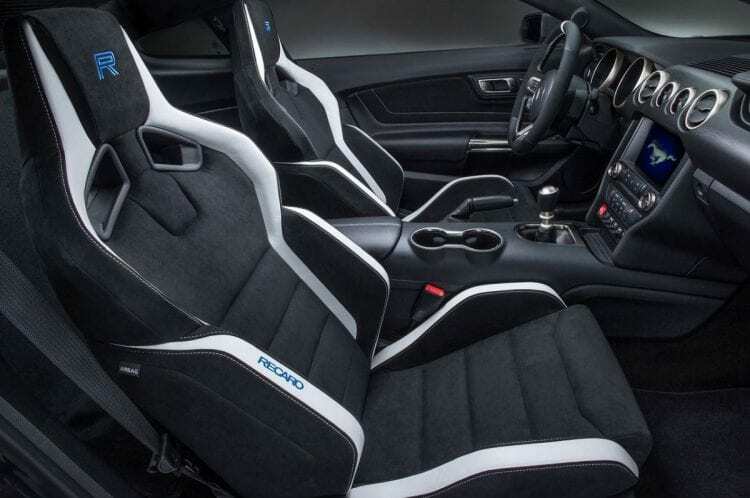 The seats are perfectly shaped for race driving and have been thoroughly tested to ensure the maximum level of comfort for the driver and passenger but still to offer enough support when you hit those curves at higher speeds. However, we quickly find that some interior elements were removed from the standard configuration of the model, including sound system, rear seats, a backup camera, and even air conditioning. Apparently, they were sacrificed by the designers for the purpose of curbing the vehicle’s mass and adaptation to better track experience. In addition to these features, emergency tire sealer and inflator have also been removed to reduce the weight even further. Although we completely understand why they were removed, maybe some of them should have been left in the standard version because it slightly limits the capabilities of the vehicle, such as the air condition and backup camera. Our little frustration, however, can be forgotten because the company can provide all these features and even more with the optional packages. For example, the Electronic package includes most of the removed elements and adds a larger infotainment screen with navigation and turn signal mirrors. Also, the customers will have the opportunity to equip the vehicle with the rear seats with the same high-quality material used on the front ones. The updates, however, is going to cost an additional $999. Under the hood, we find the same 5.2-liter engine used in the GT350 model a couple of years ago. Back then, it was a huge change but today its capabilities are well-known. However, we do not mind that Ford decided to use the same engine because it is indeed revolutionary; first, it is the most powerful naturally-aspired unit and the first-ever production V-8 from the automaker with a flat-plane crankshaft. The latter, for example, allows for a cylinder firing order that alternates between banks and decreases exhaust pulse overlap. At 526 horsepower and 429 lb-ft of torque, remains the most powerful in company’s history. The race thinking is also evident here: the automaker has provided the engine with the air-to-oil cooler found only in race vehicles. This great element allows maintaining the powertrain temperatures at an optimal level even under the most extreme conditions. The engine is coupled with the familiar six-speed manual gearbox, which was also used in the previous generation model. Although the time to reach 60 miles per hour has been reported as identical 3.5 seconds, the top speed was increased from 186 to 190 miles per hour. First and foremost, we would like to say that GT350R’s availability will be limited to North American market. For the customers there, the starting price is expected to be at least $63,450, excluding destination and tax charges. Although this price represents a $10,000 increase from the GT350, it’s still lower than most of the competitors’ prices in the segment, including Chevrolet Camaro Z/28, which starts at $75,000. It is a good question if it is worth $10k premium over “standard” GT350 vehicle. If this model makes its way across the ocean to European markets, it will also be one of the cheapest in the segment because the rival MBW M4 costs more than $65,000. We think that the prices do not play a significant role here because no car is a complete match for this Mustang. What plays a role here is the limited number of GT350R production, which was announced by Ford earlier. There are no specific figures, but it is certainly disappointing for Mustang fans all over the world. On the other hand, if you do decide to buy one of these and you are lucky enough actually to get it you will certainly have one vehicle that will soon become part of the automotive history.